If you cancel your booking 48 hours or more before your arrival date no fee will be charged. If you cancel your booking less then 48 hours before arrival date or in the event of a no-show, the total of the first night's accommodation will be charged to your payment card. In cases when the price of the booking exceeds 3000 UAH or the number of people is more than 6, prepayment is required. The amount of prepayment is 50% of the total reservation cost, but not less than the cost of the first night of stay. This payment is made by charging your card on the reservation day and not later than 7 days before arrival. Total refund of the prepayment (excluding banking commission) is possible in case of cancellation at 48-hours term before arrival. VAT included. City tax is not included and will be charged upon check in - 16.69 UAH from citizens of Ukraine and 41.73 UAH from foreign citizens per night per guest. Breakfast is not included. It can be ordered by surcharge at cafe DRUZI (located in the property). 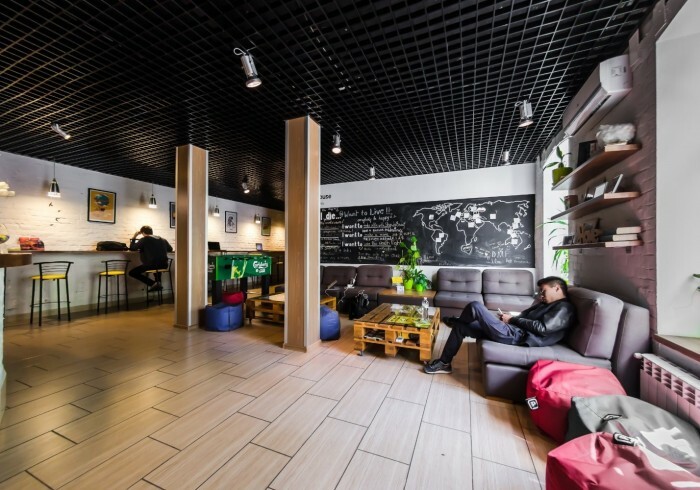 DREAM House Hostel was opened in 2012 as the biggest and most modern central hostel in Kiev with its own Bar&Cafe! We are located in the separate 4-stored building with our own spacious and quiet yard, on the most fascinating street in the city! We are a great place to socialize and reflect on your experiences of the day. Head to the bar to get yourself a well-deserved drink or two and chill out. It's lively, friendly and unmissable. We've also got great beds for sleepy heads and of course you'll be enjoying Kiev life in the most authentic surroundings.